Sky Las Vegas, Luxury Condos on the Strip are luxury condos that offer a brand new way to enjoy Las Vegas while in the comfort of your own home. Sit back and take in the famous sights of the Las Vegas strip from your panoramic windows; lounge at the resort style pool in your own private cabana; sink into the luxurious living room youÂ’ve always dreamed of. 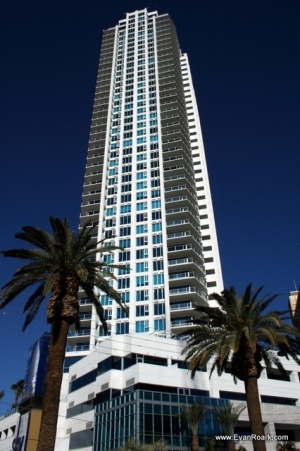 In your search for condos for sale in Las Vegas, there is no better location than Sky Las Vegas Luxury Condos on the Strip. Take in the stunning views of the bright lights and magic nights from your very own living room. Living on the Strip isnÂ’t just about the views when youÂ’re only minutes away from magnificent hotel/casinos like the Wynn, Venetian, and Mandalay Bay, and classic attractions like World Famous Fremont Street, there are endless opportunities for a night out on the town. Gym The fitness center features state-of-the-art equipment to reach your health and fitness goals. Pool Unwind at the resort-style pool. Enjoy private cabanas that feature television and wi-fi. Movie Room - Watch the films you love in a space built for comfort.